The Bank of Canada left the overnight benchmark policy rate at 1-3/4%, as expected. 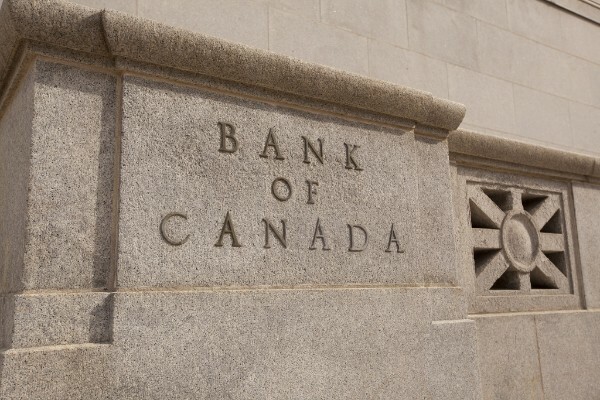 In another dovish statement, the Bank of Canada acknowledged a slowdown in global economic activity and highlighted that oil prices are roughly 25% lower than what they had assumed in the October Monetary Policy Report (MPR). The lower prices primarily reflected sustained increases in U.S. oil supply and increased worries about global demand, especially in light of a potential U.S.-China trade war (see oil chart below). The Bank also commented that these worries had been mirrored in bond and stock markets. 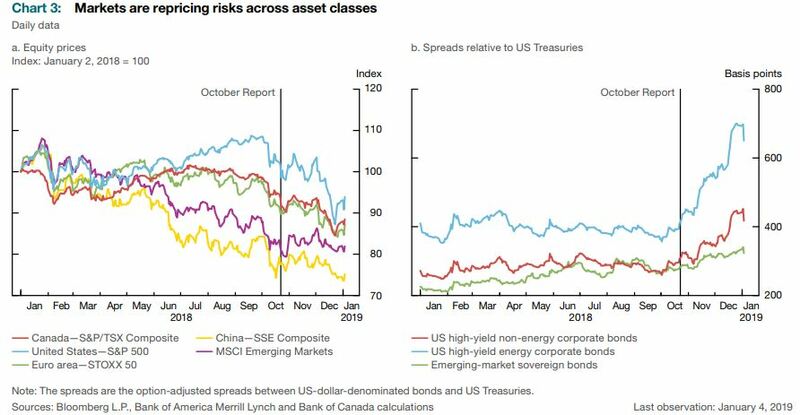 Credit spreads off Treasuries have widened, and stock markets have sold off around the world (see chart below). Equity prices and bond yields have declined in the face of market unease over global growth. Volatility has risen, and corporate credit spreads have widened sharply. A tightening of corporate credit conditions is particularly evident in the North American energy sector reflecting the decline in oil prices. Weak oil prices negatively impact the Canadian economic outlook and "transportation constraints and rising production have combined to push up oil inventories in the west and exert even more downward pressure on Canadian benchmark prices. 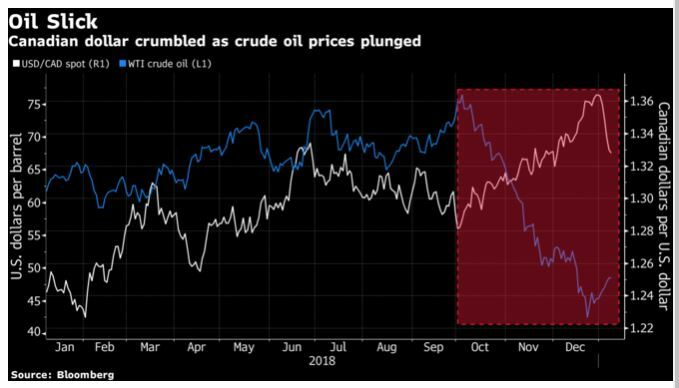 While price differentials have narrowed in recent weeks following announced mandatory production cuts in Alberta, investment in Canada’s oil sector is projected to weaken further." The Bank acknowledged that the economy is running close to potential, unemployment is at a 40-year low and trade will likely improve with the weak dollar, the trade deal with Mexico and the U.S. (now dubbed "CUSMA") and federal tax measures to target investment. Nevertheless, consumer spending and housing investment "have been weaker than expected as housing markets adjust to to municipal and provincial measures, changes to mortgage guidelines, and higher interest rates. Household spending will be dampened further by slow growth in oil-producing provinces." The contribution to average annual real economic growth from housing investment has been revised down to -0.1% this year from the +0.1% forecast in October. The Bank of Canada revised down its forecast for real GDP growth in 2019 to 1.7%--0.4 percentage points lower than the October outlook. According to the Bank, "This will open up a modest amount of excess capacity, primarily in oil-producing regions. Nevertheless, indicators of demand should start to show renewed momentum in early 2019, leading to above-potential growth of 2.1% in 2020." Inflation remains close to 2%, the central bank's target, having fallen to 1.7% in November, due to lower gasoline prices. While low gasoline prices will depress inflation this year, the weak Canadian dollar will have an offsetting impact on the CPI. On balance, the bank sees inflation returning to around 2% by late this year. Considering all of these factors, the Governing Council continues to judge that the benchmark policy rate will need to rise over time to a neutral range to achieve the inflation target. "The appropriate pace of rate increases will depend on how the outlook evolves, with a particular focus on developments in oil markets, the Canadian housing market, and global trade policy." Bottom Line: The Bank of Canada for the first time admits in today's MPR that the slowdown in the housing market has been more dramatic than the Bank's staff had expected. The January MPR states, "provincial and municipal housing market policies, the tighter mortgage finance guidelines and higher mortgage rates continue to weigh on housing activity. Slowing of activity in some markets has been associated with less speculative activity. As a result, it is difficult to evaluate the sensitivity of non-speculative demand to the various policy changes. Monthly indicators have signalled that spending on housing likely contracted again in the fourth quarter. Weaker-than-expected housing activity in recent months and staff analysis suggest that the combined effect of tighter mortgage guidelines and higher interest rates has been larger than previously estimated. The Bank will continue to monitor developments in housing markets to assess how construction is adjusting to the shift in demand toward lower-value units." The Bank see less urgency to raise interest rates as the economy copes with slumping oil prices and weak housing markets. The five interest rate hikes since mid-2017 are having a more substantial impact on spending than the Bank expected. A short-term pause in rate hikes is now likely. The economy slowed considerably in the fourth quarter of last year, which will continue in the first quarter of this year owing to the decline in oil prices and the Alberta government's implemented oil production cuts. While it is unlikely that the Bank is finished its tightening this cycle, expect rates to remain steady until we see solid evidence of a rebound in the oil sector and in housing as interest-rate sensitivity of Canadians is at historical highs.